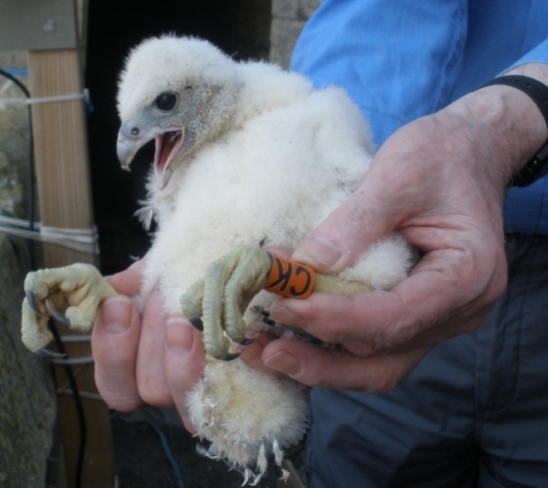 The chicks were ringed this morning, during which time the camera was turned off for 20 minutes. This was just a precaution in case anyone phoned the authorities if witnessing the chicks being taken from the nest (the local police had already been informed by us). Each chick was fitted with a standard BTO metal ring but also with a lightweight plastic colour-ring (orange with two letters) so that each bird can be individually identified in the field. At the same time an extra 'L'-shaped piece of plywood was added to the far end of the nest tray to provide the chicks with some welcome shade..........and they made use of that shade later today - the hottest day of the year so far.